Lots of low-end torque: The DOHC 16-valve cylinder head with direct cam actuation and 11.6:1 compression ratio contributes to the engine's effortless performance at low and mid rpm, allowing you to smoothly pull away from 1,500 rpm—even in sixth gear. Dynamic performance: The liquid-cooled 649 cc four-cylinder engine uses a compact internal architecture with cylinders canted forward 30 degrees for a lower centre of gravity and an impressive power-to-weight ratio. 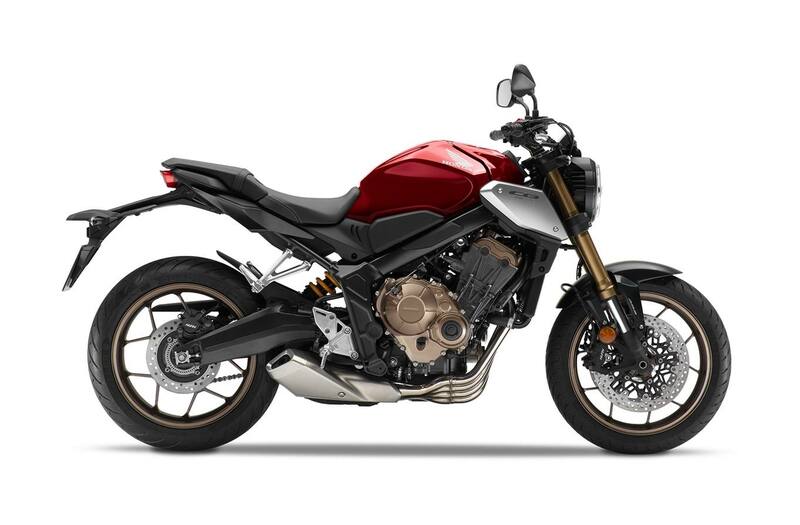 New HSTC torque control: New to the CB650R, the Honda Selectable Torque Control System (HSTC) controls torque output by detecting differences in the slip ratio between front and rear wheels. When the rear tire loses traction on a slippery surface, HSTC instantly kicks in and suppresses torque by controlling fuel injection to inhibit rear tire slip. User adjustable, the system can also be turned off. Even more power: A revised intake and exhaust, along with new cam timing and compression ratios, provides a 5% peak power boost and smoother, stronger torque delivery through the mid-range. 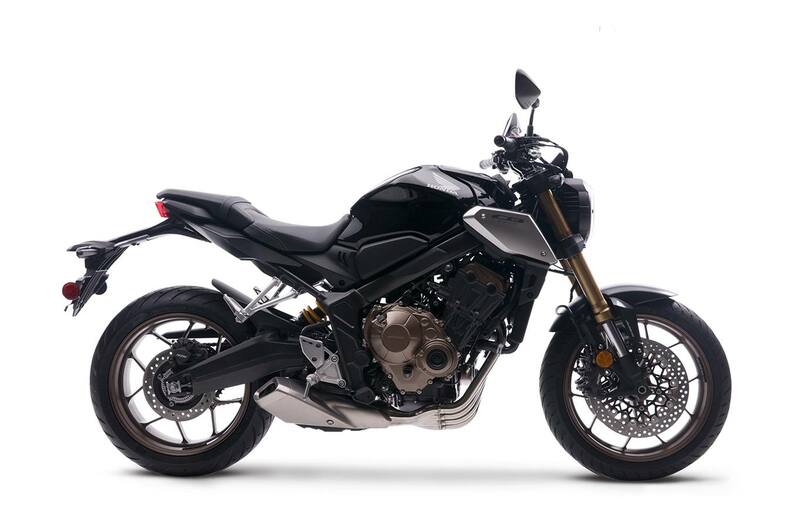 The engine now also revs to 12,000 rpm—an extra 1,000 rpm compared to the CB650F. New slipper clutch: Not only does the new slipper clutch help to prevent rear-wheel lockup on downshifts, it also reduces the effort it takes to operate the clutch lever. Quality engineering: Asymmetric piston skirts, ferrous spines on the cylinder sleeves and a silent SV cam chain using a Vanadium coating on its pins ensure reduced friction, minimal oil consumption and improved heat transfer. Quick response: The PGM-FI fuel injection system operates with information from four separate throttle body sensors for crisp and accurate throttle response. Optimal fuel economy: Specific fuel-injection mapping and ignition timing work together to optimize fuel economy and deliver impressive range from the generous 15.4 L fuel tank and its 300 km range. Streetfighter design: The exposed side-swept downpipes pay homage to the vintage CB400 while offering a modern streetfighter design twist. The updated exhaust, featuring new twin air ducts on either side of the fuel tank, feeds the airbox with a larger volume of air (as opposed to the single, central duct of the old model), which also produces a throaty intake roar. The exhaust now also sports a larger bore tail pipe (up from 35 to 38.1mm) inside the muffler to flow more gas and, with its exit pipe angled upwards, to also howl emotively for the rider's benefit. Sharp response: New twin-duct air intake works with the updated exhaust to improve airflow, increase power, and create a robust exhaust note. Rapid acceleration: With reduced weight, improved airflow, the numerous engine improvements, and a quick-shifting six-speed transmission, the CBR650R produces thrilling acceleration as you click through the gears. New inverted fork: New inverted front fork and adjustable single rear shock complement the CB650R's sporty character. The shock operates directly on the curved gravity-die-cast aluminum swingarm. Lighter frame: Upgraded for 2019 to be even lighter and to improve mass centralization, the twin-spar steel frame is engineered for sharp handling and a high level of rider feedback. Better braking: Dual 310 mm wave discs with radial-mounted four piston calipers offer confident braking, while a 2-channel ABS provides peace of mind during sudden stops or when riding on uncertain surfaces. Lighter wheels: New Y-shaped five-spoke blacked-out wheels combine rigidity with reduced weight for more nimble handling and improved bump absorption. Comfortable seating: A more aggressive riding position for 2019, combined with reduced overall weight and improved mass centralization, make the CB650R an even better choice for sporty, everyday riding. Neo Sport styling: With a fresh new look for 2019, the CB650R represents the naked shape of things to come. Its bold Neo Sport styling and minimal bodywork come together to deliver an aggressive, clenched-fist appearance, further accented by the crisp LED headlight, clear-lens LED taillight, and LED turn signals. Digital display: The backlit digital display tells you everything you need to know about your ride, with a speedometer, tachometer, odometer, gear indicator, fuel gauge, clock, warning lights, plus all trip details including average speed, fuel consumption rate and elapsed time. Safe and sound: A compact wave-design ignition key offers increased security and reduced chance of breakage.